I’ve never been to war. I watch it from the comfort of my kitchen usually while I’m cooking dinner from a well-stocked refrigerator. I’ve never carried a gun. But my heart aches for those who carry one every day, knowing it could be the only thing that saves their life or that of a fellow soldier. I’ve never said goodbye to someone I love, fearing I may never see them again. But I’ve watched flag-draped caskets arrive back on US soil, where mothers and fathers grieve the loss of a child. I’ve never had to be separated from someone who is my whole world while they fight for a freedom I get to appreciate every day. But I’ve known brave families who get down on their knees every night and pray for the day they can hold their husband/daddy/wife/mommy in their arms again. I’m going to preface this post by saying I have no family in the military. It’s kind of amazing actually since my family (extending on both sides) in the grand scheme of things is HUGE! So I come at this holiday only as an observer, an American who supports soldiers and their families 110%, but who freely admits that I’m tired of having sons and daughters, brothers and sisters, cousins, aunts and uncles, husbands and wives, mothers and fathers killed on foreign soil every day. There is just something wrong when the Sunday morning news program showcases the losses of wars and has no problem finding families who’ve lost loved ones in the last few months. 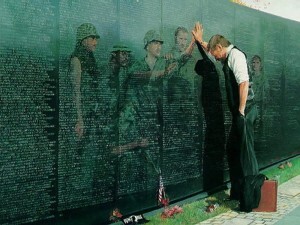 It makes me so sad how many soldiers have been killed. I know these soldiers and their families believe in the war they’re fighting and I admire them, really I do. I’m not over in Iraq or Afghanistan. I don’t live there. I don’t know any families over there. I don’t know any soldiers who have seen the horrors going on in those countries. But I’m really just not sure fighting day in and day out in such dangerous conditions is really making the United States a safer place to live. On this Memorial Day I say prayers for the safety of the men and women serving overseas and for their families who wait anxiously for their safe return. I hope this year will see the end of America feeling like they have to be the world’s bodyguards and bring our service men and women home.